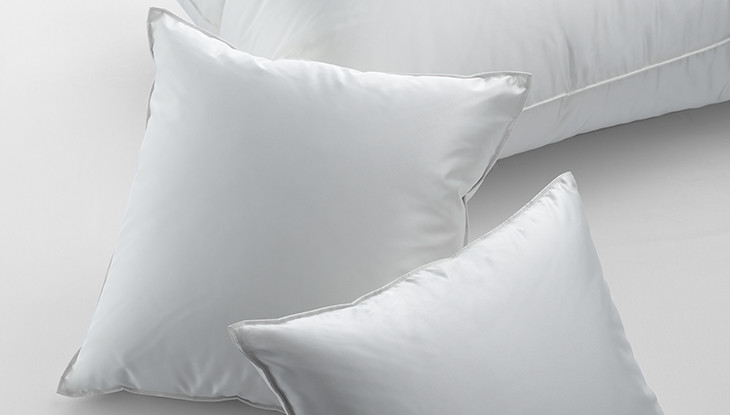 A pillow with a silk cover and exclusive filling bestows you with a particularly luxurious sleep experience. The synthesis of a fine covering material combined with an exquisite filling results in an incomparably soft and cosy product. Only the finest, the very best is good enough. We pay attention to every last detail, from production right through to finishing. Each cover is produced entirely by hand with the greatest of care in our Swiss atelier. High quality down with its fine branches and millions of air chambers provides the perfect sleep climate, with a continual balance between «warm» and «cool», «dry» and «moist». That is what gives you the incomparable snuggle down feeling. In just seconds, they produce an incomparable “snuggle-down” feeling. The higher the quality of the down filling, the lower the fill weight can be because it is not the fill quantity but the fill power that determines how much air remains trapped and hence the degree of warmth retention. When you select your new duvet, look for one with the highest possible down content because down provides the best breathability combined with the lightest weight. 100% pure, new goose down, white. Extra large cluster European Top quality. Class I (European norm). 100% silk, extra high quality satin made of fine mulberry silk, down proof, hydrophilic. Colour champagne.